Peter Ramsauer during his meeting with CSC Chairman Abdulrahman Al-Zamil. 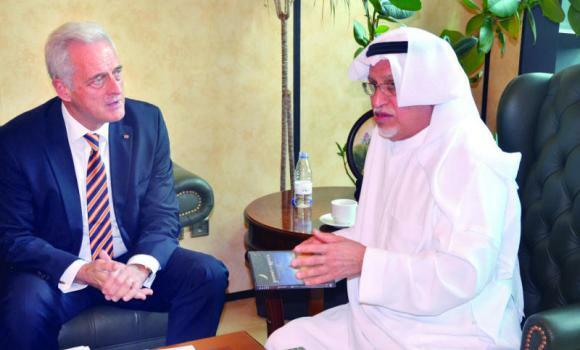 Peter Ramsauer, chief of the German-Arab Chamber of Commerce and Industry, has held high-level talks on strengthening bilateral cooperation in Riyadh. Ramsauer and his delegation met with various government agencies and business sectors, including senior officials in the Shoura Council and the Council of Saudi Chambers (CSC). The two sides discussed the scope for cooperation between Saudi Arabia and Germany in economy, trade and investment fields, and also the mechanism to set up investment projects in the two countries. They dealt with issues such as trade promotion and ways of boosting Saudi exports to Germany in a bid to increase the volume of trade, taking advantage of business-friendly policies in the Kingdom. CSC Chairman Abdulrahman Al-Zamil welcomed the efforts to promote closer economic and trade ties between Saudi Arabia and Germany and the possibility to allow a greater flow of trade and wider opportunities for joint ventures. Referring to growing trade relations between the two countries, Al-Zamil pointed out that German manufacturers set high standards in technological innovation and their commitment to quality raises the chance for stronger business links. He emphasized the importance of cooperation between the two countries in terms of small and medium enterprises. According to Al-Zamil, both the Saudi and German Chambers are playing their role in improving the investment climate. He stressed the need to explore the opportunities available under the umbrella of this special relationship in various sectors including renewable energy, transport, electricity, health, housing and various fields of manufacturing. For the German side, the visiting official highlighted the giant investment projects under way in Saudi Arabia and its healthy investment environment. These factors make it one of the advanced economies of the world, he said. He expressed his country’s desire to offer more cooperation in technical training, SMEs and housing, infrastructure. He also called for more cooperation among private sector enterprises.